According to its "Readers' Most Wanted" section. 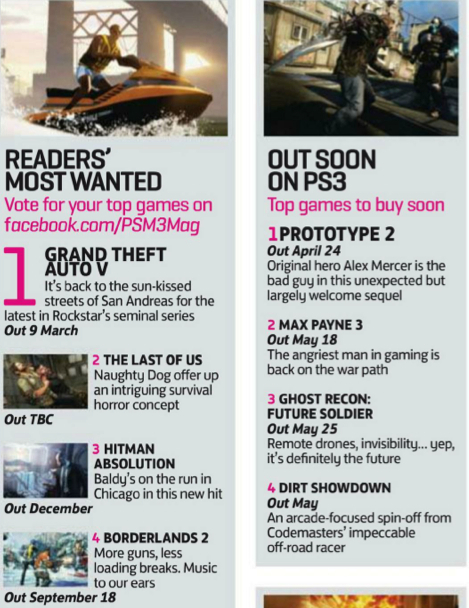 According to the latest issue of PSM3, Grand Theft Auto V will debut at retailers on March 9 (2013), and Hitman: Absolution in December this year. We’ll e-mail Rockstar and Square Enix for comment. Thanks, GTA Forums (via Pinoy Tutorial). Update 2: Square Enix has said that it has not released a Hitman: Absolution date beyond the general 2012 release window.